I want to finally do something with one of my spare bedrooms. I've been trying to decide what combination I want to turn it into, and I've decided to make it it's own office. My 3rd bedroom will be a guestroom, but one thing at a time. I've been looking at a lot of inspiration on Pinterest and Youtube, and finally decided on a few key items. I'm thinking about making a series where I show before photos of my room, it's progress and then do a final room tour. What do you think? My first step is going to be painting, and I am very indecisive! Since my livingroom is going to have a grey stripped accent wall, I don't really want to repeat that pattern upstairs. Or do I? I might do the same thing (especially since I'll already have the paint) and do opposite walls with the stripe. Ahh! Decisions, decisions! 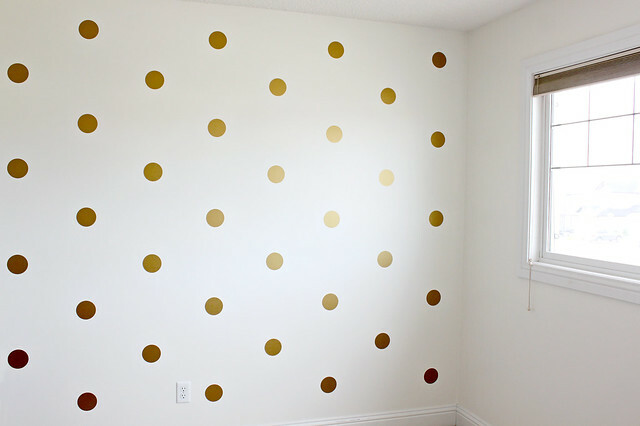 I'm kind of digging this polka dot wall that Christine from Just Bella posted. I absolutely love her office and especially her dressing table. I get a lot of inspiration from her blog and I am an avid follower. Just love her! I love these kinds of posts as I'm currently redoing my vanity/office/meditation room. So much to consider! Almost done and can't wait to reveal. You have awesome taste too so I'm sure your touches will come in handy. It's going to be nice, whatever you decide to turn it into. I'm in desperate need of an office makeover as well. I love that lamp and chair!